That state and Coast Guard are responding to a sunken vessel in the Haines Harbor and fuel leaking from the boat is hampering the commercial gillnet fleet that homeports in the harbor. The 76-foot Neptune sank while moored at the harbor about 1 a.m. Saturday. No one was aboard. The boat can hold about 2,000 gallons of fuel. Local harbor staff responded when notified shortly after 1 a.m. on Saturday. Harbormaster Phil Benner said he and his staff had to use axes to cut the lines so the dock didn’t sink with the boat. They placed oil containment booms at the harbor’s entrance and shut the harbor to boat traffic. Haines Harbor masters work to cut loose the life raft from the salmon tender Neptune Saturday morning, Oct. 5, 2013 in Haines, Alaska. Photo by John S. Hagen. “Everybody’s moving as fast as we can but we want to make sure we aren’t contaminating Lynn Canal by opening up the harbor,” Benner said. By mid-morning, diesel could be smelled throughout the harbor and was wafting toward downtown Haines. As the tide receded in the afternoon, the diesel in the water caused a dark line on the rock breakwater around the harbor and along the grassy beach. Ice totes and items from the boat that floated to the surface washed up on nearby beaches. Local responders from the Southeast Alaska Petroleum Resource Organization mobilized and assisted with adjusting containment booms. A local diver was called in to dive on the boat and try to plug leaking fuel vents and lines. Officials with the Coast Guard and Alaska Department of Environmental Conversation arrived by mid-day. Lt. Ryan Erikson with the Juneau Sector Coast Guard said spill response is one of the missions of the Coast Guard not affected by the federal government shutdown. “We were asked to curtail a lot of missions, but marine response and search and rescue have not been curtailed at all,” he said. Erickson said the Coast Guard will also investigate the cause of the sinking. The Neptune is a privately owned tender contracted by Ocean Beauty Seafood during the commercial fishing season. 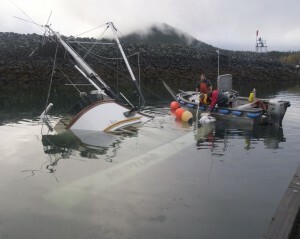 No fish were on board at the time it sank, but it was planning on leaving for the fishing grounds in the Lynn Canal on Sunday along with the fishing fleet. Haines fishermen were notified that another Ocean Beauty tender, which was en route to Washington, was turned around at Petersburg to come to the Lynn Canal. The Coast Guard and DEC officials met with local ADF&G commercial fisheries biologist, Randy Bachman, and decided the salmon opener could continue on Sunday. However, each boat will have to go through a washing and decontamination station before it leaves the harbor. Fish and Game also adjusted the district open to fishing and shifted a boundary line further south from the harbor.